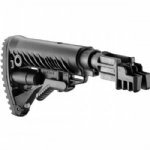 Reduce recoil and muzzle rise with a six-position recoil-reducing collapsible stock system for AK47/74 stamped receiver weapons. Fits AK rifles using unique receiver block that expands to perfectly fit stamped receivers when screws are tightened. Requires no fitting for most stamped AK-47/74 rifles. Perfect for Saiga shotgun conversions. Effective recoil compensation system. MIL-SPEC reinforced polymer composite.